Here’s a way you can take advantage of the fact that not everyone on eBay is a spelling bee champ. Let’s say you’re looking for a home theater system, preferably one made by Klipsch, whose speakers you’ve always admired. 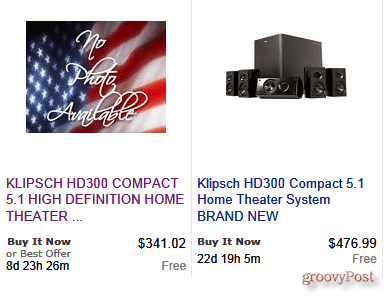 Sure enough, check out the second screen shot, where one seller didn’t know how to spell Klipsch. The auction is for the same model as the two more expensive systems, and it’s new, just as they are. 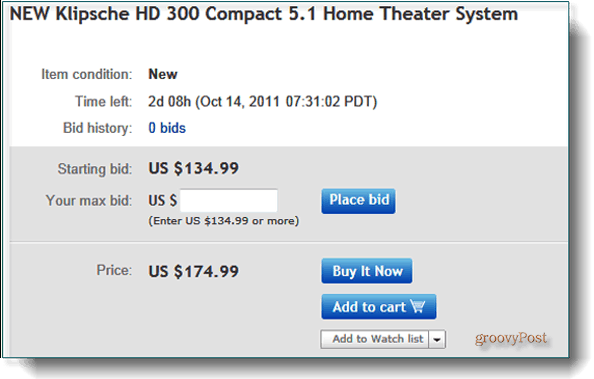 It’s safe to say you’re the only one looking for a “Klipsche” home theater because this system hasn’t received any bids. You can grab it before anyone else has a chance at the $175 buy-it-now price, or you can take the chance that not too many other buyers are on to this spelling trick, and bid to get it for $40 less. Here’s my own list of often confused terms. All right, the last one I just made up. But the others are real, and shows being inventive with spelling often pays off. Give it a try next time you’re screen shopping at eBay. how can u b sure its the same company as the correct spelling company? eBay makes things way way too difficult. I want to like ebay, but am I the only one that finds myself utterly defeated by it at times? I can’t tell you what I went through recently just to pay a fee I owed. I had to wait for them to tell me I was late in my payment just to get a link for a “one-time payment” that I could do. Crazy. blah blah blah (sorry not enough sleep). If someone started a company named “Klipsche” selling identically styled and named models as Klipsch, there would be a trademark suit so fast your head would spin. As a lifelong poor speller, I can testify that spelling ability has little to do with whatever other talents and skills we may be blessed with. For feeback, check a seller’s rating, not his writing. India’s Largest Real Estate Portal – http://www.DeRealtyExplorer.com. List Your Real Estate @Free !. 100% Genuine Responses for your advertisement. Register FREE. Individual, Agent, Builder, NRI, Students, Bachelor and Others with us, Unlimited benefits in the field of Real Estate….